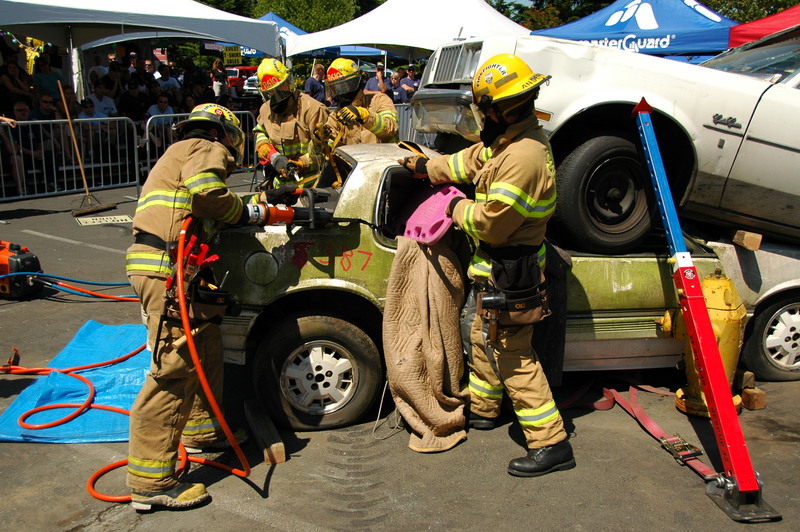 As automotive technology continues to evolve rapidly, the “basics” of vehicle extrication have to evolve with it. Safety measures like side and curtain airbags that didn’t exist a decade or two ago are positive advances for vehicle occupants, but they pose new challenges to rescuers. So, a quick, high-level review of current extrication procedures is never a bad idea. Ensure that the vehicle has been fully stabilized using step chocks, wedges, cribbing, and/or struts. Disconnect battery cables to allow airbag capacitors to drain, reducing the chances that a bag will deploy during extrication. After front airbags have been disengaged, check for other hazards such as side or curtain airbags. Look for the SRS (supplemental restraint system) lettering on the side of seats and doors, as well as on the plastic above the doors and on the post. If other airbags are present, be sure they are disengaged as well. Peel back interior molding to expose steel structures so you can decide where you will make cuts if needed. Determine if the patient is trapped (meaning nothing is restraining them but there is no clear path for exiting the vehicle) or pinned (meaning they are physically restrained by some part of the vehicle). If the patient is trapped, the next step is typically to remove a door to provide an exit path. You may have to remove the “B” post and displace two doors in some cases. Another option is to remove the roof. If the patient is pinned, determine exactly where they are being restrained and by what material. Then push, spread, or cut the material as needed. Remember that energy from the use of power tools can impact the patient. Be sure you know how they will be affected before you take any action. Not only do we sell the gear needed for safe and effective vehicle extrications, we know how to use it. If you have questions about our product line or techniques, don’t hesitate to contact us at (888) 427-3728 or email sales@rescue42.com.